Here is an offer for an Old Navy 20% off coupon to anyone who screams as part of a Halloween-themed sale going on this weekend. There is a surprisingly entertaining - and adult themed - 3:50 video that slowly unravels the mystery of the coupon. The screaming coupon is only valid today and tomorrow, Oct. 29-30, 2010. 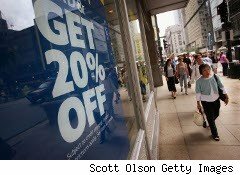 The 20% off coupon is valid for one item and you can only use it once. Earn your coupon by letting out your best howl at one of Old Navy's in-store "scream stations." Caveats: coupon is only valid in Old Navy stores in the U.S. (including Puerto Rico) and Canada. Not valid in Quebec or online. Not valid on gift cards or outerwear. Cannot be combined with any other discounts.